Jon Ungerer grew up fishing on the Big Blue River. As an avid sportsman with a lifetime of experience, it would take a pretty spectacular night of catfishing to be considered his “best ever”. 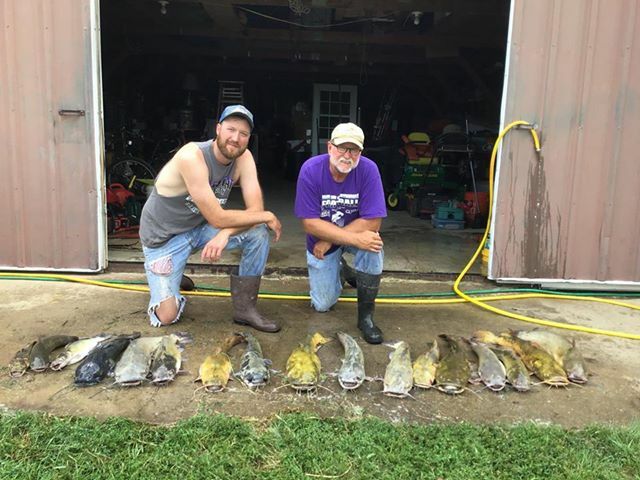 So when his three boys James, Jeremiah, and Jared came in town in early July to bank line some catfish, he thought it would be like most other nights. Little did he know his “best ever” was in the very near future. It was a trip where everything fell into place. A big rain the night before had the river up and moving. As Ungerer and his sons piled into the small jon boat, they had a feeling the night would be productive because the channels and flatheads were spawning. “I hoped it would be good since my boys were in town”, Ungerer said. He steered the flat bottom boat toward the first line they set hours earlier. The current was strong and the boat struggled a bit to overcome it. The first line was down, and when they pulled it up they could tell it had good weight to it. Moments later, a nice channel cat was in the boat. A great start! They baited the line again, carefully choosing from their selection of large minnows and crawdads. Soon they drifted to the second line and noticed it, too, was bent over. That one produced an even bigger fish, this time a flathead! Line after line they checked and each one produced a great catfish. They repeated the process multiple times, motoring back to the first line only to find more fish on each run they made. “It was one after another!” Ungerer exclaimed, recounting the evening. “Just a great night”. Jon Ungerer and his son, James, posing with some of their night’s catch. The trip was an exciting blur. They ended up with about three hundred and twenty pounds of catfish, which they gave away to family and friends. The biggest fish weighed eighteen pounds. The clear sense of pride in his voice was apparent when the senior Ungerer spoke about his boys. Together, he and his sons happened upon one of the greatest gifts fishing can give that night. The bond formed by a father and son fishing together is a powerful thing. It can heal relationships and forge new ones. His summary of the evening says it all. The Ungerer’s could have checked lines all night without boating a single cat and they still would have looked back on the night as a success. So the next time you think about calling your son or your dad to go fishing and the “yeah buts” or the “I have a lot to do’s” start to creep in, make it a priority to go. Whether you catch something or not, someday you will look back at the memory and realize that the best catch does not always require a net. Big Blue River, Catfishing, Lee's Summit Area Fishing, Missouri, Payden Hays. Bookmark.